After our Trail Days excursion, we dropped back 70 miles into Tennessee where we had left The AT. After 3 days off, it was time to get back to it. Over four days, we hiked the 70 mile stretch that brought us into Damascus. We enjoyed Jones Falls, Laurel Falls, and a lunch stop in Hampton, TN, conveniently located next to a gun range that shares my last name. Some days you hike, some days you shoot a .22 and hike. We arrived in Damascus after completing the 8 miles into town. We made a bee line for burritos at Hey Joe’s and checked into Crazy Larry’s hostel. $20 for tenting, laundry, and a hot shower with a real towel!! We enjoyed our half day with four frozen pizzas and beer. Well, welcome to Virginia. Virginia claims about 25 % of the Appalachian Trail. That comes out to about 550 miles. We were told it would be beautiful. True. We were told it would be flat. Super not true. 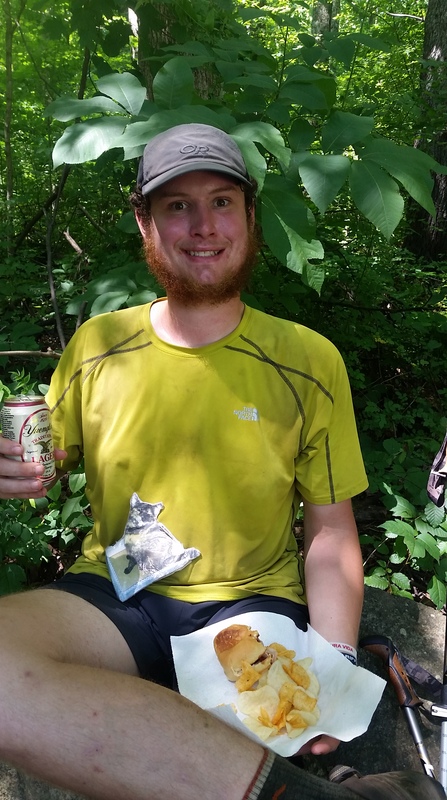 I guess this must be a running joke from past thru hikers to the current ones. But, if you heard and believed that Virginia is flat, well, someone got you. …not what I would call flat. We left Damascus with a trail highlight just around the corner. The Grayson Highlands were 35 miles away, and we were thrilled to see the main attraction – wild ponies!!! It was a beautiful Saturday morning, not a cloud in the sky. We hiked up and up seeing more hikers than usual. But not more thru or even section hikers. The weekenders were out in full force. Oh yea, it’s Memorial Day weekend. Near the summit of Mount Rogers (Virginia’s highest peak), the crowds became noticeable. When you go from seeing a dozen or less people per day to seeing a couple hundred people in a two mile stretch, it can be a bit… shocking. But the crowds couldn’t take away from this beautiful day. And as luck would have it, plenty of ponies came around to say hello. The Grayson Highlands also include crossing mile 500. Still a lot to go, but 500 felt pretty good. From the Grayson Highlands, we pushed on to the Atkins, VA gap to The Barn Restaurant where a package was waiting for us. We happily devoured the 1 lb hiker burger and got our resupply that would get us another 90 miles to Pearisburg. While finishing lunch, another hiker approached us. A woman had offered a room in her house to a couple of hikers and could take two more, but they needed to go right away. Considering it looked like rain, we decided to take the spontaneous offer and were so glad we did. Trail Angel, Murray, took us to her beautiful country home. Her late husband was a thru-hiker, and she knew just what we needed – a shower, clean laundry, and food!! Murray took us to a Chinese buffet and stopped at the store for us to pick up a few essentials. She even got groceries for a big breakfast in the morning. She really knew how to spoil us. Thanks for the hospitality, Murray. You’re generosity will be remembered for many miles. The next day, we still put in 15 miles happy from our excursion the night before. In four days, we hiked the 90 miles to Pearisburg including two back to back 24 mile days – our biggest yet. Who am I!? In town, we were happy to conquer another Chinese buffet. After lunch and grocery shopping, we were about to make our way back to the trail when we saw some familiar faces. Toastie and Downhill were snagging beers to pack in at the gas station, and we were stoked to see them. We had met these two during our first couple weeks before we took time off for injury. After many weeks of following them in the shelter logs, the day had come where we caught them!! Ha!! Well, back at it again. From Pearisburg we would hike 95 miles to our next stop, Troutville. In Damascus, we caught word of a hiker feed June 5 in Troutville as part of Troutville Trail Days. Troutville also promised free camping in the town park and free showers and laundry at the fire station. With a good goal ahead, we set off for the 95 mile stretch excited for Dragon’s Tooth, McAfee Knob and Tinker Cliffs. But the weather had something else in mind other than our great views. Over five cloudy and rainy days we hiked from Pearisburg to Troutville. Nearly all five days began and ended with wet clothes. And all the views were stolen away by dense fog. When you only have one shot to see a viewpoint, statistically, you’re going to miss some of them. Well, just another section to come hike again. No pain, no rain, no Maine. And we’re going to Maine. While munching, we checked out our goodies. One package was sent from Kelty. We use a Kelty Salida 2 for our tent and our fly had a busted zipper. We emailed Kelty and they agreed to send us a whole new tent!! Now that’s customer service. Thanks, Kelty!! The other package was basically a full resupply from my mom. After lunch, we made our way to the town park and set up camp. Before we knew it, it was time for the hiker feed we had rushed to Troutville for. The Church of the Brethren had prepared homemade fried chicken, spaghetti, green beans, macaroni and cheese, salad, and they had a banana split bar!!! Woah. After dinner, we headed to The Pomegranate to watch a local Grateful Dead cover band, The Kind. Grateful Dead and Get Bent IPA in my hand? Groovy. The next day we did our chores and enjoyed a free all you can eat pancake and bacon breakfast. A few hours later, a shuttle came and picked hikers up that wanted to go tubing down the James River. Yep, sign me up!! Sunday morning, we grabbed some Shoney’s breakfast buffet and hit the trail. This time with enough food to get us the 120 miles to Waynesboro. We set out to complete the stretch in 5 days which somehow turned into 7. I guess you could say we got a little distracted from hiking with food – first pizza in Glasgow then the infamous and highly Micro approved Devil’s Backbone brewery. After crossing the James River footbridge, we quickly found a ride into Glasgow and hit the Monday all you can eat pasta special. We camped in the convenient designated hiking area in town and stuck around for pizza for lunch. We tried to hike, but the pizza put us into a deep food coma that turned an 18 mile planned day into a 2 mile “near-o” day in the woods. A couple days later, it was time to conquer the big descent off The Priest then immediately climb 3000 ft up Three Ridges Mountain. Honestly, we really deserved beers at Devil’s Backbone after all that hard work. Plus, it’s a brewery 5 miles off the trail. No one really twisted my arm. And wow was I impressed. Not only has this brewery won tons of awards for the beer, it is a whole complex. Well, under construction, but this fantastic brewpub will soon include a second restaurant, an outdoor amphitheater, a walking path with secret gardens, a cigar bar, and a shower house with laundry for hikers. Oh, and free camping. Is this what heaven is like? No, no. Heaven doesn’t include a hangover. Or hungover hiking. Which is very, very challenging. Yet we survived 14 miles leaving 5 to finish up into Waynesboro the following morning. If anyone’s keeping track… 861 miles down, 1327 to go Katahdin. Tomorrow, we head into the Shenandoah’s and will arrive at the “official unofficial halfway point” in Harper’s Ferry. Half way right around the corner!?!? WAHOOO!!! !